Belconnen’s theme for their Mad March Quilt Competition is ‘Autumn in Our Town’ using autumn coloured fabrics in their challenge pack, which are here displayed above one of the finished entries now on display in-store for voting. 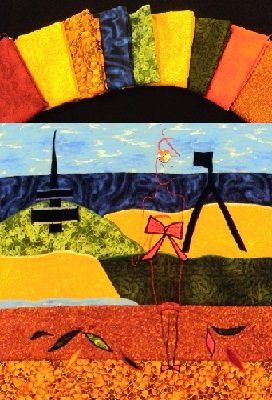 It shows some of Canberra’s landmarks (Telstra tower & Parliament house flagpole). Wow!